Every year the Yellow Pages gets smaller and smaller. This is because the worlds ink lakes are slowly dry up. What will business do when there is no ink left? The Yellow Pages will not be able to advertise their services, and businesses will surely suffer terribly. 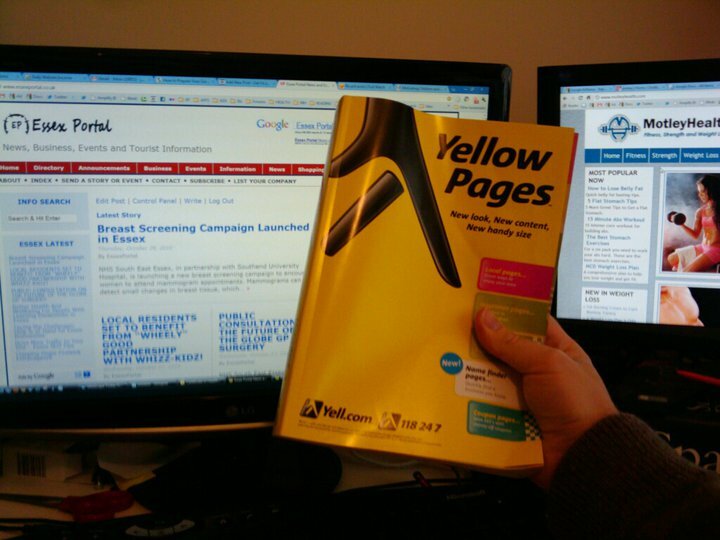 Last year Essex Portal demonstrated how the size of the Yellow Pages had decreased in Essex year on year for 3 years. The latest publication is not only thinner, but smaller too. The Essex Yellow Pages is now smaller than A4. The funny thing is, that it is now actually more useful. The Yellow Pages that were weighing us down during the dawn of the technological revolution were really a bit too big. Too many companies competing for the space, plus they just got in the way because of their size. Now you can easily grab the Yellow Pages in one hand and take it with you in the car or even leave it on your desk to use when you need it. The old one was so big it selfishly needed its own home on your shelf and was forever getting in the way. On a more serious note though, how long can the Yellow Pages survive. Savvy business owners now get more traffic to their websites using Google Places / Google Maps (or is it Google Local now?) than they ever got with the Yellow Pages. Does anyone still use it? I have a copy, but not opened it yet. Lets take a look …..
We still get the Yellow pages delivered as well and we don’t use it. Interestingly, their stock price ( Yellow Media YLO ) is heading back up again. Partly i imagine because they do internet advertising as well.